As 'no fuss' as it gets, the AT2020 USB should appeal to podcasters and home musicians alike. Simple, fuss-free connection. Clear recording quality, particularly on vocals. Useful table-top tripod included. No gain control or headphone input. USB microphones have grown steadily in popularity in recent years, with many consumer and professional microphone manufacturers now offering at least one USB model. Providing ease of use via a direct plug-and-play approach, USB microphones neatly circumnavigate the problems of trying to record a decent-quality signal to a computer via a simple solution. "As the USB microphone market hots up, competition is growing stiffer and the good news is that quality is climbing accordingly"
Rather than requiring any form of pre-amp or external audio interface, the theory is child's play - just plug in and record. As the market hots up, competition is growing stiffer and the good news is that quality is climbing accordingly. 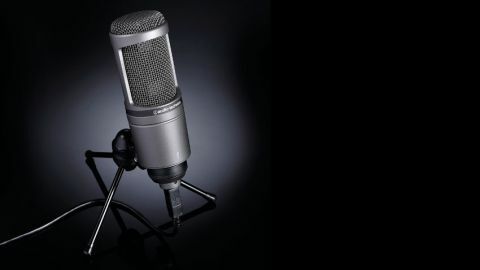 Audio Technica's existing microphone collection contains the cardioid-pattern studio condenser AT2020 model and, as its name suggests, the subject of this review is closely matched to its specification but with the added benefit of a direct-to-computer connection. "Those flocking to this kind of microphone include recordists interested in podcasting and voiceover capturing for movie projects"
As those flocking to this kind of microphone include recordists interested in podcasting and voiceover capturing for movie projects, one nice addition is a desk-based tripod. This integrates a microphone clip which can be detached if you want to rig the mic up on a stand. The tripod gently tilts the microphone upwards which is useful as this is a side-address design and quality drops appreciably if you don't record directly into the mic at the right angle. When USB-connected, the microphone features a bright blue LED but unlike some of its rivals, the AT2020 USB is a strictly 'input' device with no port for headphone monitoring your computer's output via the mic body itself. For that, you'll either have to rely on an audio interface or your computer's headphone port. Equally, there is no gain control here, so you'll be reliant on your computer's input controls to regulate recording levels. "We first tested the mic on spoken word recordings and it produced a pleasingly up-front sound while retaining good depth"
We first tested the mic on spoken word recordings and it produced a pleasingly up-front sound while retaining good depth. It has a subtle sweet-spot, enhancing upper mid-range and lower treble signals but it's not an offensive lift by any means and will certainly serve the intended purpose of providing a touch of built-in 'studio gloss'. With a frequency response of 20Hz to 16kHz, you're certainly not going to find this is a microphone devoid of air. The same thing is broadly true of sung vocals, which make great use of one of the microphone's best qualities - a tonal consistency across a wide dynamic range. We also tested the microphone on acoustic guitar and were pleased with the body sound, in particular. As the side-address design on the microphone lends itself towards a fairly directional approach, you can focus the microphone fairly closely when recording larger sound sources, so while you won't get a wide sonic picture, you will get a pleasingly low-noise, focused and accurate one. There's no doubt that the microphone deserves success in its intended area, that of providing high-quality home recording for podcasters, musicians and for voiceover requirements alike. This market continues to become increasingly competitive, so if you like the idea of a USB microphone for any of these applications, be sure to familiarise yourself with the features and options of Audio Technica's rivals too. However, if 'quality of recorded signal' is your most pressing requirement, the AT2020 USB is right up there.